I started using MyFitnessPal at the start of the year 2016 but I won’t be blogging about that until I’ve gotten the results I wanted. One of the things I like about it, though, is the fact that it gives me a rough estimate of the nutritional value of the things I cook. 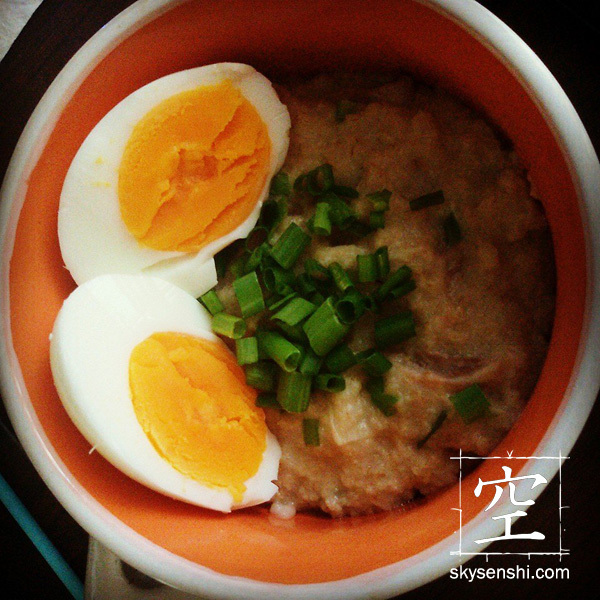 So now I know what kind of nutrients are inside this Oats Arroz Caldo that I made for breakfast. 1. Sauté garlic and ginger root (and a bit of lemongrass, if you want) in olive oil. 2. Add chicken and continue to sauté until cooked. 3. While this is cooking, dissolve half a cube of Knorr chicken bouillon in a cup of water. Pour it into the pan. Stir and then let it simmer for a bit. 4. Add the oatmeal. You can use rolled oats, which has higher calories BUT is actually healthier because it has lower glycemic index and not as heavily processed. 5. Add as much water as you need. I added 3 more cups of water to make a thick porridge, but you can add more if you want a soup-y consistency. Stir. 6. Add the fish sauce. I only added 1 tablespoon because of sodium considerations (too much is bad for you). But you can add more if you find this too bland, especially if you want porridge with soup-like consistency. 7. When it’s cooked, you can top it off with chopped spring onions and a sprinkle of toasted garlic. Add a few drops of lime or calamnsi for more kick. Also goes well with hard boiled egg. I took a screenshot of this dish’s nutritional value that MyFitnessPal computed when I entered the ingredients manually. The values are ballpark figures, since these could also change based on the brand you’re using. As a rule of thumb, I always go for the low-sodium variants (except for the fish sauce and bouillon cubes because low-sodium versions of those are hard to find).